Check out the winners and all submissions for our Behind the Lens: Surgery Science Image Contest, held annually as part of our Research Summit. This image shows fluorescently labeled smooth muscle cells undergoing late stages of apoptosis, a form of cell death. This type of cell death can often be characterized by cell shrinkage, DNA fragmentation, and structural rearrangements, which can all be visualized using immunofluorescence microscopy. The cells shown here exhibit reorganization of their microtubules (green), which normally help maintain the structure of the cell. It is thought that this reorganization can help maintain membrane integrity and prevent the release of cellular contents and nuclear fragments (nucleus in blue) as the cell dies. This is particularly important since spillage can elicit abnormal responses in otherwise healthy neighboring cells. We utilize fluorescence microscopy frequently to aid in understanding cellular responses to drugs that might have therapeutic potential for treating cardiovascular diseases. 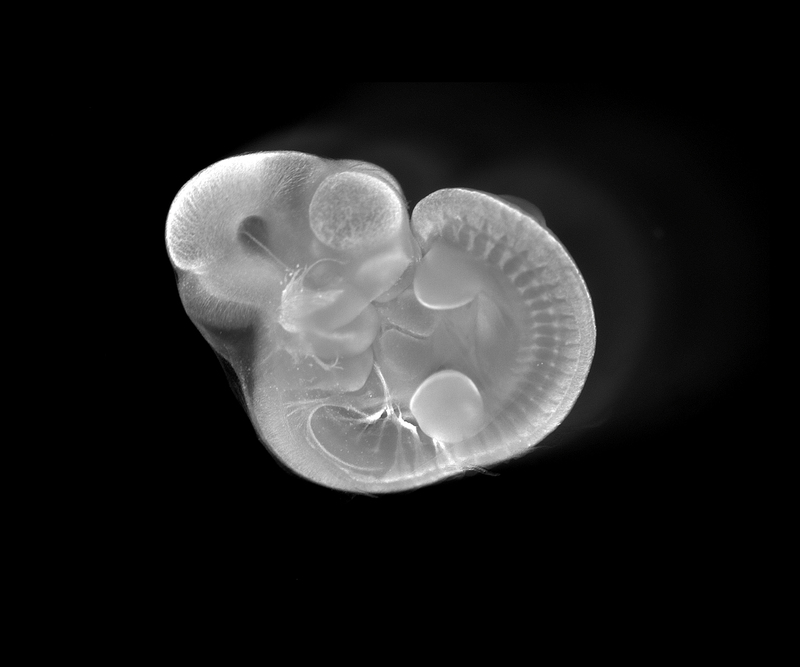 The image represents a whole mount staining for TUJ1 gene showing peripheral nervous system (cranial and spinal nerves) in a developing mouse embryo at embryonic day 10.5 (bright signal). At this time, the larynx initiates its development and prospective vocal folds temporarily fuse together to form the epithelial lamina. This transient structure is subsequently recanalized, allowing vocal folds to separate and open the airways. Similar to humans, the process of vocal fold separation is synchronized with differentiation of vocal fold epithelium and with development of laryngeal cartilages and muscles that are innervated via peripheral cranial nerves. Failure in proper differentiation of vocal fold epithelium and supporting structures results in congenital laryngeal disorders such as laryngomalacia, laryngeal webs, subglottic stenosis and/or vocal fold paralysis. Characterization of the regulatory mechanisms controlling vocal fold development will help in devising therapeutic strategies for targeting these disorders and optimizing surgical techniques for their corrections. 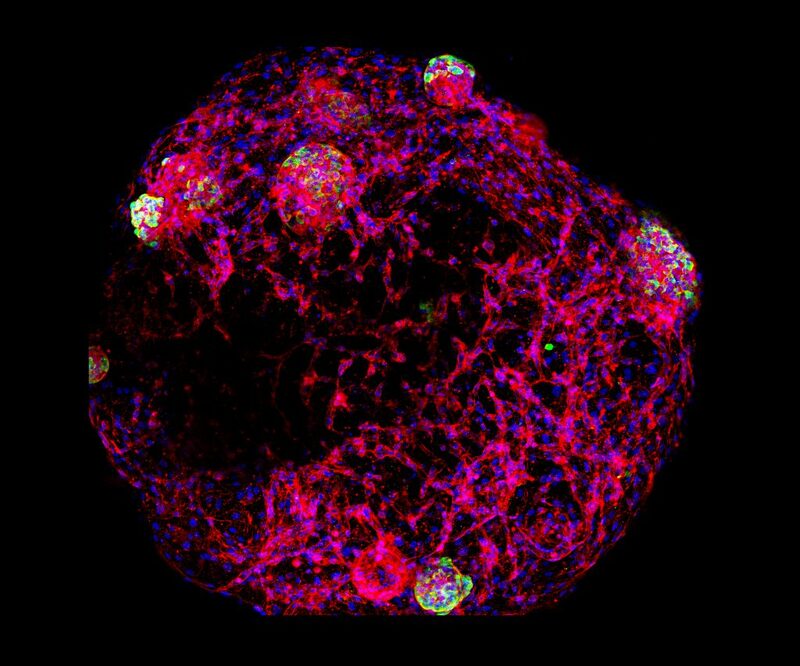 This image depicts human islets and endothelial cells embedded within a droplet of human pancreatic ECM hydrogel (developed by the Odorico lab). After 3 days in culture, the endothelial cells have formed vessel-like 3D tubes (F-Actin stain, red) which may enhance the culture and transplantation of islets (insulin stain, green). 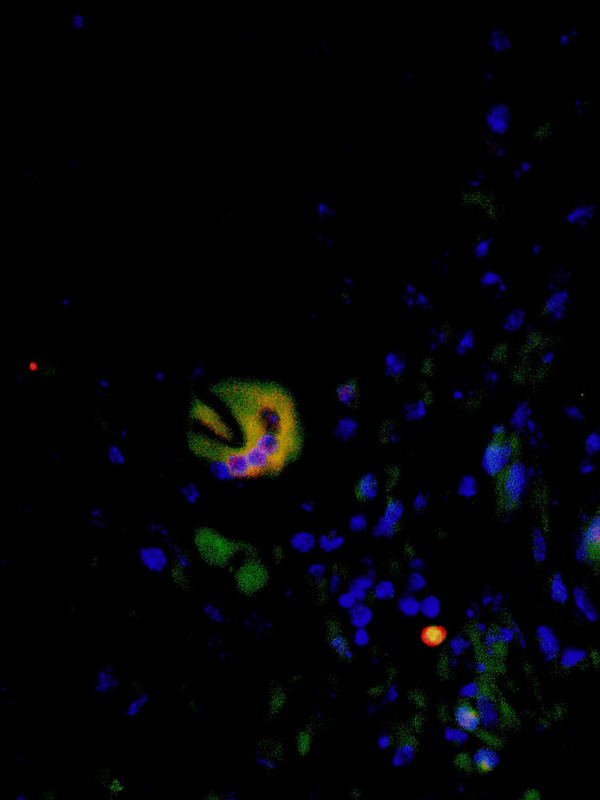 DAPI (blue) stains all cell nuclei. Islets can be cultured for only a very short time after isolation; survival is a major limiting factor in the long-term function of transplanted islets. Developing a method for culturing and transplanting islets which enhances survival and facilitates better engraftment could significantly improve islet transplant as a diabetes therapy. The image was taken using a Nikon A1Rs confocal microscope, with whole-mounted hydrogel constructs to generate 3D images. The 3D composite was then flattened to create this maximum intensity image. These images depict a thoracic aortic aneurysm developing in the ascending portion of the aorta of a mouse. These images were collected on a pre-clinical ultrasound system, which uses wave frequencies of 40 MHz, roughly 4 times the resolution of ultrasound used clinically. From left to right, these stills display the aorta and heart in diastole and systole. Some anatomical structures visible here include the right atrium (RA), left ventricle (LV), the pulmonary trunk (PT), ascending aorta (Ao) and the brachiocephalic, left common carotid and left subclavian arterial branches. Compared to images at baseline, the aortic root in these images is significantly distended. This imaging system is a unique and powerful tool for studying the development of aortic aneurysms in small animal models. These models do not require the depth penetration of clinical ultrasound and thus can be visualized with much higher frequencies. Ultrasound enables us to monitor the growth of aneurysms over time and assess what effect our therapeutic interventions have on the natural history of the disease in our mouse model. We further use ultrasound to explore the changing mechanical properties of the diseased aorta, such as wall strain, shear stress and pulse wave velocity. Images acquired using the FUJIFILM VisualSonics Vevo 2100. The top panel shows the intrinsic tongue of an adult WT mouse. The bottom panel shows the intrinsic tongue of an adult Dp(16) mouse model of Down syndrome (DS). Thin longitudinal tissue sections of the tongue were stained for a fast Myosin Heavy Chain isoform 2b (blue) and a relatively slower Myosin Heavy Chain isoform 2a (red), then imaged on an epifluorescence microscope. An interesting fact about these mouse tongues is that they are comprised of four separate interdigitating muscles, which can be seen here as alternating columns and sheets of myofibers with opposing orientations. Tongue function depends in part on the microanatomical architecture of these interdigitating myofiber sheets. These images are important because Down syndrome is associated with challenges involving tongue function, including difficulties with speech, swallowing, and airway patency. The image was obtained by fluorescence microscopy via immunofluorescence staining for osteoclast markers TRAP (green) and CD11b (red), and nuclear staining (blue) of a mouse carotid artery tissue section. Osteoclasts are specialized multinuclear cells that secrete proteases to break down bone tissue. The presence of osteoclast-like cells in aneurysmal tissue is interesting because their proteolytic capacity may contribute to the degradation of the vessel, leading aneurysm formation. Therefore, osteoclasts represent a novel target for therapeutic interventions to inhibit aneurysm formation. 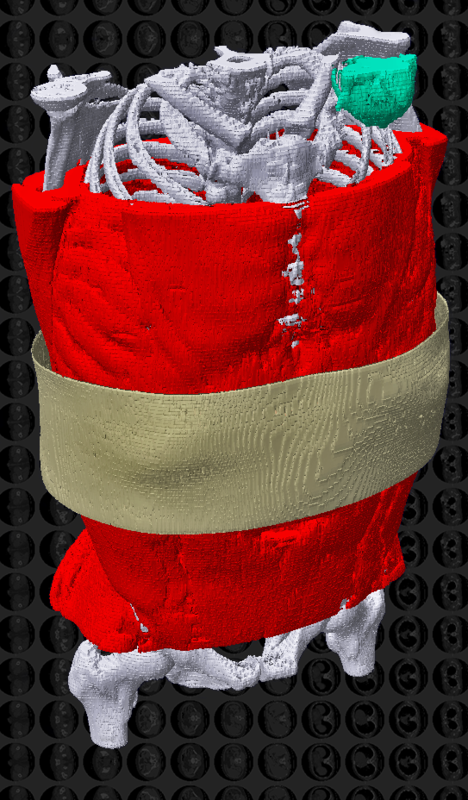 This 3D image is created from a series of 218 computed tomography (CT) scan images, as seen in the background. The pixelation is a result of the 5mm cross-sectional images and limited resolution. Our project uses CT to investigate muscle amount and quality to identify patients who will have positive outcomes following heart transplant. Our goal is to help clinicians make decisions that will improve the success of heart transplants. 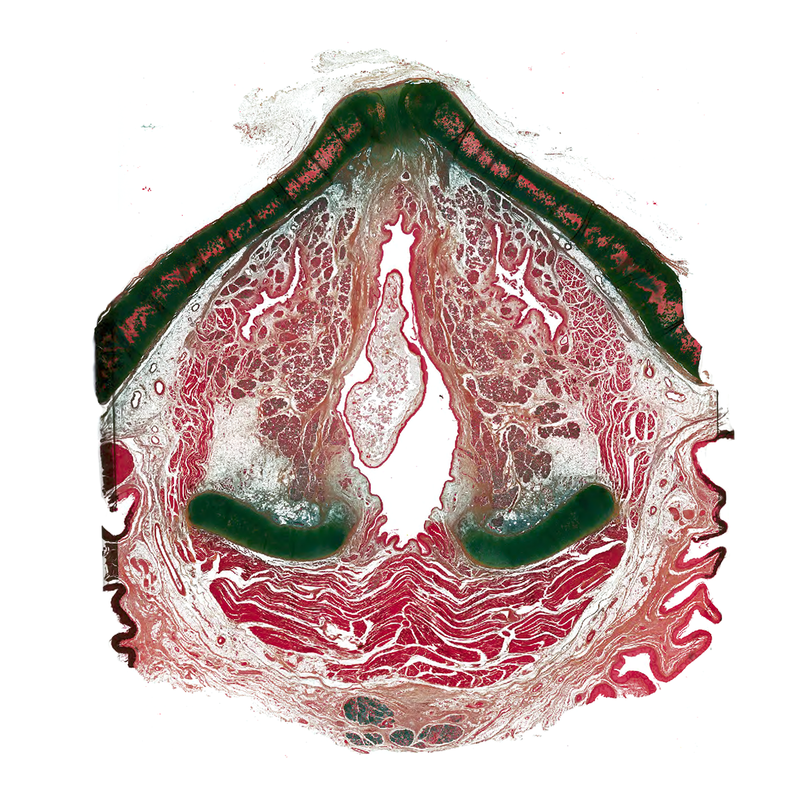 Each of the 218 slices was colored by hand to distinguish muscle for this research, and skin and bone were included for context in this image. Seen in light green in the upper right-hand corner is the artifact caused by the patient’s implanted cardiac device, which is used to sustain patients while they wait on the transplant list. 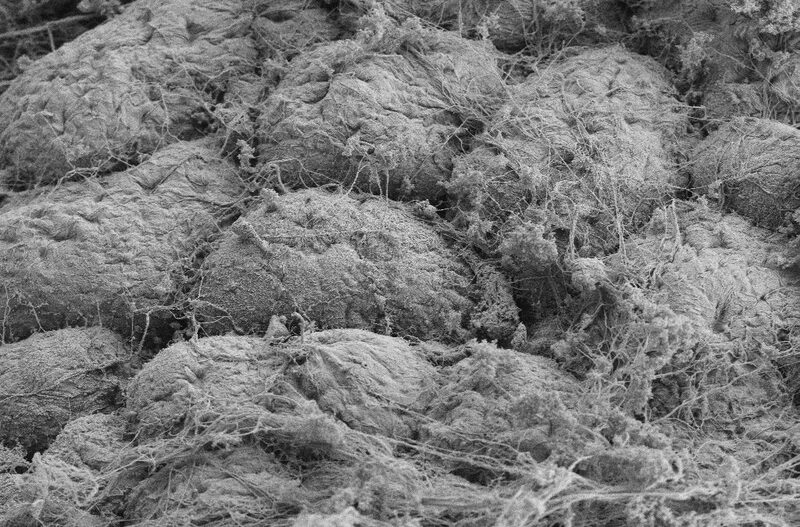 This image depicts multiple cell clusters within a human pancreas, surrounded by a complex organization of extracellular matrix (ECM) fibers. 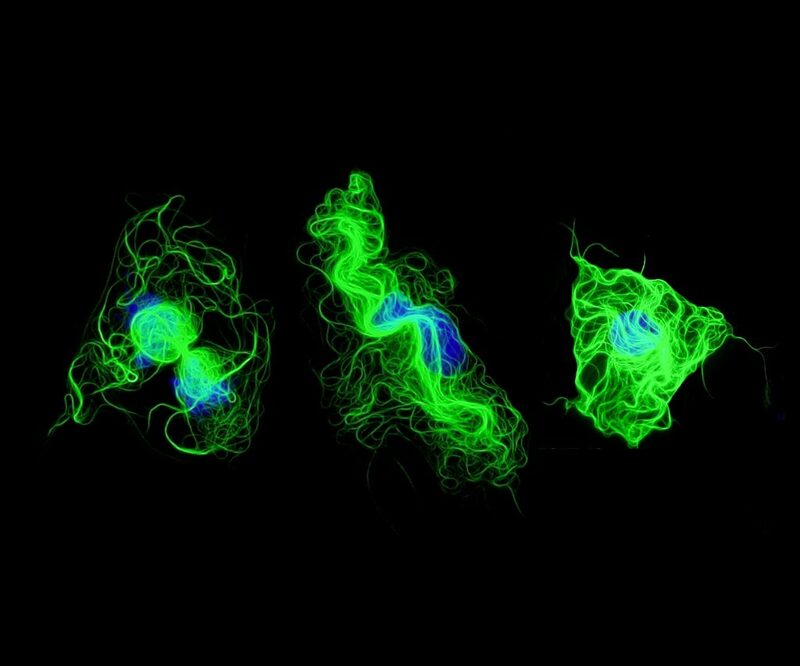 These fibers, made up of proteins such as collagens and laminins, form 3D networks within every tissue of the body, giving organs unique structural and biochemical properties which influence cell growth, migration and fate. Our lab has designed a process to produce acellular pancreatic ECM hydrogel from non-transplantable human pancreata to study how it affects cell function, specification and maturation. We believe that the inclusion of pancreatic ECM may improve the in vitro differentiation of stem cells to beta cells, the insulin producing cells of the pancreas, and will improve the survival of islets and islet-like clusters in vivo. Image taken using a scanning electron microscope, at 10,000x magnification (with Dan Tremmel and Richard Noll). Our lab collects cadaver samples at autopsy. Very rarely, we make an incidental discovery of laryngeal pathology. This is a case of a 74 year-old human female with polypoid degeneration (Reinke’s edema) that extended throughout the laryngeal airway. This axial section is ~5 mm above the vocal folds, and the superior extension of the lesion can be seen in the center of the image. Such histologic images of human vocal fold pathology are rarely seen. This was a challenging specimen to prepare for whole organ sectioning, as the cartilage was ossified; the section was also too large to photograph with a microscope!